This is a collection of 200 Japanese proverbs with illustrations and explanations for each saying. 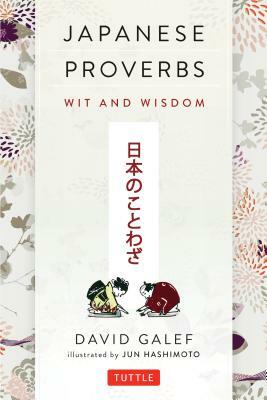 Japanese Proverbs: Wit and Wisdom is a delightfully illustrated compilation of traditional Japanese sayings and maxims. Some of the classic Japanese quotes and quotations, like "Fall down seven times, get up eight," capture the dogged perseverance of the Japanese heart. Others, such as "A red lacquer dish needs no decoration" illuminate both a universal truth and Japan's unique, aesthetic traditions. Japanese Proverbs: Wit and Wisdom has proverbs of great cultural significance as well as proverbs on matters of daily life and customs. Amateurs and Japanese language enthusiasts alike will speak Japanese with the verve and nuance of a native when they use these apt and witty expressions. David Galef is an American scholar, novelist, critic, poet, translator and essayist. He is a professor of English at Montclair State University and author of many books of fiction and poetry, including Turning Japanese (1998), Flaws (2007), and My Date with Neanderthal Woman (2011). Jun Hashimoto is a New York-based artist and illustrator. His art and illustrations have graced everything from Scotch labels to book covers.